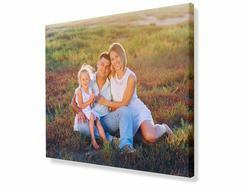 Order a custom printed canvas print featuring high DPI printing and hand stretched by us. Premium materials hand crafted ensuring 100% satisfaction guaranteed. Printed using 10 colour printers ensuring your photo is perfectly reproduced. All our canvas prints are hand stretched on kiln dried wooden frames, ensuring perfect finish. 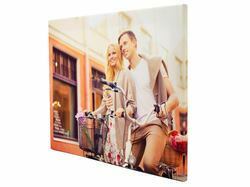 Our full range of canvas printing options feature a wall hanging kit, including a wall hook. Canvas prints make excellent gifts and are the perfect way to display cherished images of favourite moments around the home. Using the Standard or Premium services on offer, images are uploaded by the customer directly from their device or via one of the compatible social media services, then a colour effect can be applied and the border options selected. Canvases are printed using the latest in 11 colour HDR technology, with Premium canvases being made from 100% cotton for a superb finish. All canvases are stretched by hand by the printing team to ensure their quality, using kiln-dried wooden frames. Wedges are supplied to finish tightening the canvas when it is delivered and ready to hang.